The diamond has forever been the master of all gemstones. It exhibits qualities that characterize superiority and endurance. A diamond owns unique powers of light reflection. When cut to specific proper proportions, the diamond gathers light within itself and sends it back to the eye with great brilliance. It is the purest of all gemstones composed of a single unadulterated element. It is also the hardest transparent substance that exists. It is no wonder that it has forever been a sign of strength and endurance and marks the symbol of marriage and commitment. There are several variables, which determine the quality and value of a diamond. Primarily, a stone is graded by its 4 C's. These represent the cut, clarity, color, and carat weight of the diamond. The cut of a stone represents the proportions and angles which the facets form. This determines how much "fire" or "brilliance" the stone throws to your eye. There are currently standards to these angles and the cutter aims at cutting stones to these precise figures. If he strays somewhat, then the diamond looses its brilliance and hence, the quality and value decrease. 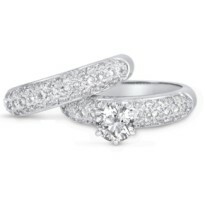 T.L.K., Inc. exhibits the utmost care in using diamonds closest to these highest standards. It inspects every stone to see that its facets are correctly proportional and its angles are precisely cut to give off maximum brilliance. The clarity of a stone is measured by the kind and amount of imperfections it may contain. The more imperfections or the bigger these imperfections appear, the less its quality and value. Imperfections can be characterized by tiny feathers, clouds, or a number of inclusions. When grading a diamond, its clarity is determined by using a 10-power jeweler's loupe or microscope. Clarity grades range from "I" (imperfect) to "FL" (flawless). At T.L.K., Inc. our diamonds must achieve a clarity rating of at least SI1-VS2 (slightly included to very slightly included) or higher. 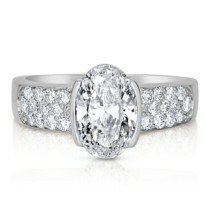 Of course, since flawless diamonds are very rare their value is greatly increased. 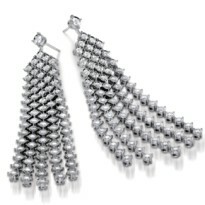 As always, custom order are welcome so we may use diamonds according to your specifications. Color is another major determinant of value. 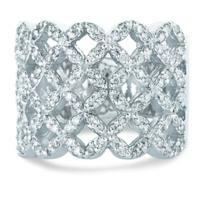 The purest and rarest diamonds are virtually colorless. Those that are not completely colorless contain some traces of yellow, brown, or gray, which may be very difficult to see by an untrained eye. Therefore, there is a spectrum by which a diamond can be graded. The spectrum ranges from totally colorless, "D", to light yellow "Z." 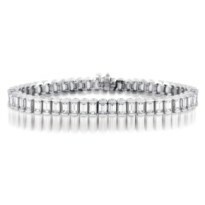 T.L.K., Inc. uses at least G-H (near colorless) diamonds or higher. 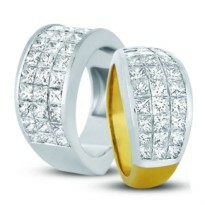 We take great care in mounting our jewelry with diamonds that are as clear as possible to ensure high quality products. The final determinant of value is a diamond's carat weight. Given that all other factors are equivalent, a heavier stone has more value than a lighter one. A stone's weight is measured by a unit known as a carat. 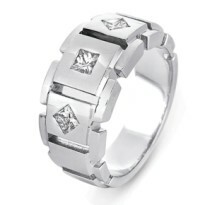 A metric carat is equal to .2 grams (about 0.007 ounces). 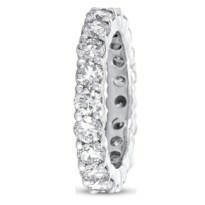 Another unit used to express the weight of diamonds is the point, a weight equal to 0.01 carat. A stone of 26 points would therefore weigh 0.26 carat. A number of individual diamonds have become famous, primarily because of their size. The largest of all known diamonds is the Cullinan, discovered in the Premier mine in South Africa in 1905. It was presented to Edward VII, king of the United Kingdom of Great Britain and Northern Ireland, by the government of the Transvaal. The Cullinan Diamond weighed 3106 carats (1.37 lb) before cutting. When the stone was cut, a total of 105 gems were produced, weighing a total of 1063 carats. The largest of these was a drop-shaped stone called the Star of Africa, 530.2 carats, the largest cut diamond in existence, and now set in the British royal scepter. The Vargas diamond, found in Brazil in 1938, weighed 726.6 carats in its uncut state. When cut in 1945, it yielded 29 stones with a total weight of 411 carats. In 1934 a diamond of almost precisely the same weight, the Jonker diamond, was discovered in an alluvial deposit near the Premier mine. The Jonker is the finest diamond ever found. It was cut into 12 gems ranging from 125.35 to 5.3 carats in weight. The Great Mogul diamond, reputed to have weighed 240 carats when cut, has disappeared since it was described by the French traveler Jean Baptiste Tavernier in India in 1665. Some authorities believe that the Koh-i-noor diamond, which now weighs 106.1 carats and is one of the British crown jewels, is a part of the Great Mogul. All colors of corundum except red are known as sapphires, while red corundum is known as ruby. It is the ruby that is among the most valuable and rarest of stones. The most important factor when considering the value of a ruby is its color, although clarity, cut, and size are also important. The finest rubies are found in central Myanmar (formerly known as Burma) in the neighborhood of Mogok, where rubies have been mined since the 15th century. Important deposits of rubies are also found in Thailand, Afghanistan, Sri Lanka, India, China, and the former Soviet republics. 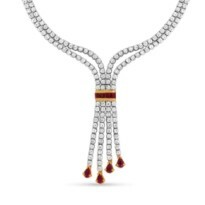 Large, clear rubies from Myanmar and Thailand are much more valuable than diamonds of equivalent size. T.L.K., Inc. uses fine rubies on its mounted jewelry, weighing price and quality to give our customers the optimal product. Any emerald is rare because of the exceptional conditions in which emeralds are formed. 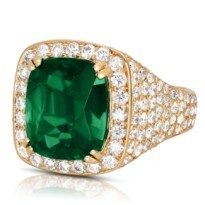 Also, the larger the stone and the more vivid the green, the more valuable the emerald. Most emeralds do have inclusions and even those with inclusions have considerable value. Referred to as jardin, from the French for "garden", by the trade, emerald inclusions are like a fingerprint, giving each emerald a distinct personality. The emerald was known in ancient times, not only for its beauty but also for its alleged power of healing diseases of the eye. Emeralds of ancient times were mined chiefly in Egypt. Very large specimens have been found in Siberia. Most gem specimens are now mined in Colombia. 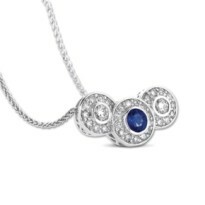 Sapphire comes in a wide variety of colors, the most famous and valuable of which is a rich intense blue. Sapphire symbolizes sincerity and faithfulness. The most renowned sources for sapphire are Myanmar and Kashmir, where sapphire was discovered in 1881when a landslide in the Himalayas uncovering these precious stones. Today, most fine sapphires on the market come from Sri Lanka, Thailand, and Australia. This stone has made a huge impact in the past few years. It has become a trend for many to wear this velvety blue gemstone. The stone was found for the first time in 1967 and was named after the country where it is mined, Tanzania. Tanzanite comes in rich purple and blues that have a depth comparable to the finest sapphire, and the rich, dramatic colors are quite affordable. Tanzanite is sensitive to heat and is trichroic; that is, it shows different colors when viewed in different directions. There is a delicate process in creating a pearl. When a foreign object, such as a grain of sand, becomes trapped in an oyster or mussel, it becomes coated with layers of a smooth, crystalline substance known as nacre. Over time this natural process produces the luminescent gem known as a pearl. Nearly all pearls sold today are cultured. This means that they are created by deliberately inserting an irritant into the oyster's tissue. 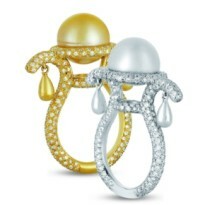 However the qualities of a pearl vary widely. This is why T.L.K., Inc. makes great efforts to examine pearls from leading producing countries such as Australia, Japan, and China to seek pearls of the highest quality and luster. As always, the pearls purchased from us can be requested in a number of different qualities to suit your needs. Please note that any of the above mentioned birthstones can be mounted on your engagement ring upon your request.